I recently decided to get into the coupon clipping "family." 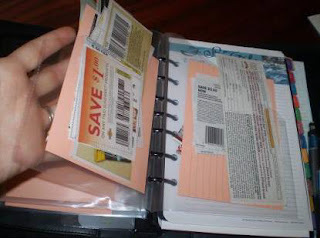 After clipping stacks of coupons and stuffing them in an envelope, I wanted to find a way to keep them organized in my planner. Looking online, I found some pre-made pouches (which were expensive) and some pocket folders I could make free by printing the template onto cardstock and then doing some cutting and gluing. Great idea, except I thought it made sense for me to be able to see the coupons, not stuff them away--remembering I am new to all this and not good at following through on most my adventures. So, I took some clear plastic page (sheet) protectors, folded them in half and creased them well so they would stay folded. This puts the white strip of holes of the page protector folded on top and then on the right side of the folded protector, you have one end sealed (the old bottom of the protector) and one edge open (which was the top of the page protector where you'd feed the paper in). I taped the open end closed with clear packaging tape. I think Scotch tape would work just as well, but this is what I had within 2 feet of my project work space. This makes 2 pockets out of one page protector. I then punched holes in the creased edge so they would fit the rings of my binder. I cut the outside edge with scissors, halfway up from the middle right to the left top, kind of the shape of a plastic magazine storage box. To make more pockets, I fit a 4"x6" index card in it so now my 2 pockets became 4. 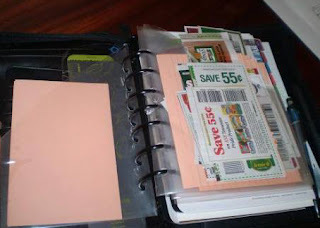 I also found Michelle's printable Coupon Category List and plan to make the tabs soon, then tape onto each pocket. This will complete my coupon planner! On a side note, I did my first ever coupon-in-hand shopping trip and after working the numbers, if I had bought my items full price, it would've been $77, had I bought only on sale (no coupons) $61, but with coupons (doubled up to $1), I spent only $33. I saved more than I spent! If that isn't enough motivation for me to follow through on this adventure, I don't know what would be better. Copyright © 2010 by Rebecca Sinnen. All rights reserved.